Place the chopped cucumber, pepper, and scallions in the bowl of a high speed blender or food processor fitted with a steel blade. Pulse the mixture until smooth. Add the can of tomatoes (and all of the accompanying juice), and pulse again until smooth. Add the olive oil, red wine vinegar and cayenne and pulse to incorporate. Season the soup with salt and pepper, to taste. Transfer the soup to a large, airtight container or tupperware (make sure the container you use is NOT metal, which will chemically react with the acidic soup and make it taste funny), and allow the soup to chill in the refrigerator for at least a day, and up to three days. Serve gazpacho chilled, topped with avocado, sour cream and some chopped, fresh herbs. 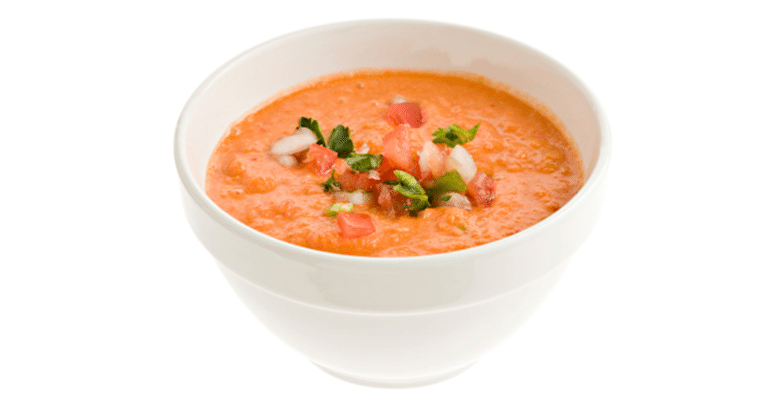 Note: chilling the soup for 24 hours before serving allows the flavors to marry and meld, resulting in the most flavorful gazpacho.